Bollywood filmmakers are seeking to cash in on this year’s Indian general election with a host of political movies, some of which smack of propaganda according to critics. The Hindi film industry has a long tradition of producing politically tinged flicks but industry watchers say 2019’s offerings are more partisan than ever before. “What we have this year are quite a few films, some of which are biopics, that appear to be uncritical and unabashedly push the agenda of a particular party, its policies and political philosophies,” said reviewer Nandini Ramnath. “The Accidental Prime Minister” and “Uri: The Surgical Strike” released on Friday. Films about the lives of two prominent politicians come out later in January, while a biopic on Prime Minister Narendra Modi is also in the works. The silver screen and politics have often intertwined in India. Many actors have become politicians while Bollywood has not shied away from tackling political issues in its plotlines. “Jaane Bhi Do Yaaro” (Let it be, friends) became a cult classic in 1983 for its satirical takedown of corruption while 2010’s “Peepli Live” was praised for tackling the difficult subject of farmer suicides. Political movies have also fallen foul of the government. “Kissa Kursi Ka” (Story of the chair) and “Aandhi” (Storm) were both banned by then prime minister Indira Gandhi in the 1970s. The former (1977) was viewed as satirising her politics, while the latter (1975) was allegedly based on her relationship with her estranged husband, who died several years earlier. Supporters of Gandhi’s party, Congress, have tried to stir up controversy around the “The Accidental Prime Minister”, holding protests and even going to court, unsuccessfully, to try to block its release. They claim it portrays senior Congress members in a bad light and is propaganda for Modi and his ruling Hindu nationalist Bharatiya Janata Party (BJP) – allegations the director denies. The Hindi-language film sees veteran actor Anupam Kher, a vocal supporter of Modi, play the leader’s predecessor Manmohan Singh, of the Congress party, as the prime minister. It is based on a memoir written by Sanjaya Baru, a former adviser to Singh. “This film is not about politics but about the relationship between Dr Singh and Sanjaya Baru through Baru’s eyes. They are both heroes of the film. It’s not propaganda,” director Vijay Gutte told AFP news agency. Some social media users and film critics have accused Kher of comically mimicking Singh’s slow and measured way of walking and talking but the actor believes he has captured his mannerisms perfectly. I think it’s about time to call out Anupam Kher ji for the TERRIBLE portrayal of Shri Manmohan Singh. Dr. Singh neither walks nor talks like Mr.Kher does in the film. “It will take you a little time to distinguish between the real and the reel,” Kher tweeted last month when posting a photo of Singh alongside one of himself in character. “That is the authenticity and the sincerity one has applied in portraying #DrManmohanSingh,” he added. 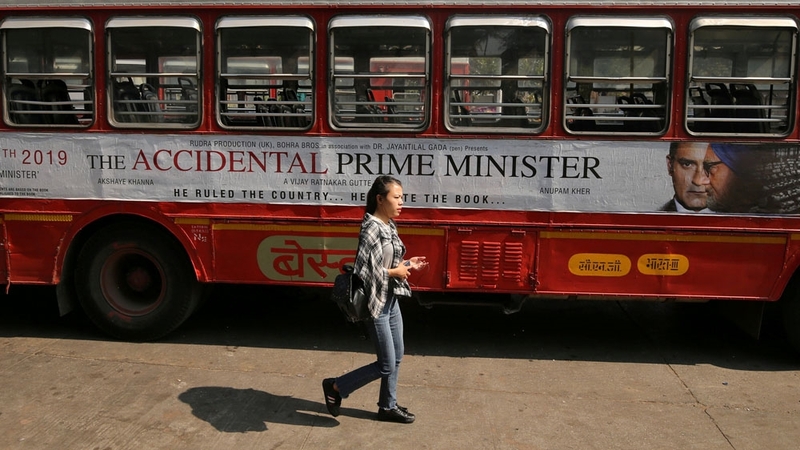 However, a reviewer called “The Accidental Prime Minister” an “out-and-out propaganda film, created for the specific purpose of making the former prime minister look like a weak, spineless man”. Several movies touching on politics were released during India’s last election year in 2014, notably “Youngistan” and “Bhoothnath Returns” in which superstar Amitabh Bachchan played a ghost running against an evil candidate. Filmmakers say it makes good business sense to release movies with a political backdrop in the run-up to an election, while others may be secretly hoping that they translate into votes as well. The nationalistic, all-guns-blazing “Uri: The Surgical Strike” which celebrates the Indian Army’s attack on fighters in 2016, in response to a raid that had killed 19 Indian soldiers, is likely to be popular. Modi was widely lauded for the operation and the film sees Vicky Kaushal play an army major in charge of avenging the attack – which India blamed on its archenemy Pakistan – on the Uri base. “Thackeray”, a biopic about divisive Mumbai politician Bal Thackeray, who died in 2012, is tipped to be a hagiography designed to boost support for the Shiv Sena – a Hindu chauvinist party he led and founded. A Shiv Sena politician has written the screenplay of the movie, which is scheduled to hit screens on January 25, around what would have been Thackeray’s 93rd birthday. January will also see the release of the first of a two-part Telugu-language biopic on actor-turned Andhra Pradesh politician NT Rama Rao. “… Popular cinema has emerged as an arena for propaganda, with a greater ability to sway opinion and spread ideas than other media,” said Ramnath, a critic for Scroll.in.